I keep finding myself repeating my general advice about what to expect and how to prepare for your first Abraham event – so finally clued in that this would make a great article! I’ve written about Abraham-Hicks many times in previous issues and blog posts, so I’ll just briefly outline who they are and then share my best tips about attending your first experience with them. In short, “Abraham” is a non-physical intelligence that Esther Hicks (an American woman) ‘channels’. This means she quiets her conscious mind and opens up to receive information from a universal source (which early on she nicknamed ‘Abraham’ although this source is not just one individual as the singular name would suggest). She’s remarkably quick and has been providing this incredible service for over 20+ years – traveling the U.S. with her husband Jerry Hicks and their close team for an extensive schedule of workshops and cruises. Well, it’s an opportunity for you to see Esther ‘do her thing’ – in a one or multi-day event or a weeklong cruise. I’ve been to 6-7 workshops and have attended four of their cruises (Hawaii, Mexico (X2) and Alaska), as well as listened to just about every workshop recording there is. The format of each workshop is very simple – Jerry opens the day and invites Esther up onto the stage. Esther says ‘hi’ then ‘bye’ (literally!) … takes a few deep breaths – and ‘brings Abraham in’. Abraham does an opening talk, for 15-30 minutes or so. Then, the floor is opened for people to ask questions. The Hot Seat is the affectionate term given to the chair that is taped to the floor in front of Abraham. People come up to the chair, sit down, have their microphone adjusted, and then ask their question of Abraham. Abraham gives an answer. All of the Q&As are meticulously recorded and indexed by Jerry Hicks, and now also filmed by their dedicated video duo, Mike and Karen. People ask every sort of question imaginable from the mundane to the sacred. They ask about m0ney and abundance, love, relationships, children & parenting, weight, the meaning of life, business, physics, death, politics, current events, illness – basically you name it. As a coach I am always fascinated to hear what will be asked and what answers Abraham will give – as the questions are often things that my clients and I are also grappling with. Abraham workshops have really grown in size – with the worldwide distribution of their materials by Hay House (heck, you can find their books in Costco now!) Be prepared to have upwards of 500 people in attendance with 7-10+ people making it up to the chair throughout the 10am – 4pm agenda. How Are People Selected for the Hot Seat? People are selected to come up into the Hot Seat by Abraham – who reads their energy and readiness to ask. They have explained that people’s faces do not register with them, only their energy does – which lights up. You must be ‘aligned’ in order to get up in the seat. This means that you must have something you want to know and have no qualms about coming up and asking it. Your openness to the answer, while nice, is not totally necessary. In fact, given the intensity of Abraham’s energy, you might need to listen and re-listen to the recording several times to get the full and multi-level depths of their answer. This was certainly my case when I was fortunate enough to have my own question answered by Abraham during a Hay House Radio call-in show. My advice, whether you think you want to go up and ask a question or not – is to write down all of the different things that you want to know about. Take some quiet time the night before or in the early morning to put down onto paper the things that are most up for you personally. What you most want to know. I have found that through the course of the workshop, you will get your answers (through the answers given to other people’s questions) for all of the things that you write down … often just within the first few hours. At the lunch break, review your list and write some more, given more questions will emerge from your exposure to the day’s thoughts. I also highly recommend that you order the full workshop recordings while you are there. They are offered onsite at a reduced pr1ce the day of the workshop for all attendees (almost half off what they regularly are). Not only is it a very good deal but you will want to have those recordings to listen to again and again. This material is very deep. You will hear things differently as you progress through time. There are no coincidences that you picked a particular workshop to attend. You came because there was specific information that you wanted and needed to hear. Getting the recordings will help insure that you get what you came to hear. I listen to my answer that they gave me on the radio show and I still hear different things in it, and I’ve listened about 20 times! The depth and power of the information is remarkable – they not only know who you are but who you are in the process of becoming – and they talk to both versions of you simutaneously. To get you in the Abraham mood there are plenty of materials available. I suggest browsing the Abraham-Hicks YouTube channel for great video clips. And, for beginners, the DVD called The Secret Behind the Secret is excellent – it will give you the back story behind Esther and Jerry’s remarkable story (in their own words … one of the few times you actually get to hear these two speak in depth) as well as a panorama of the common questions that people typically ask. There are also many books you can read. My hands down favorite is Ask and It is Given – as a process junkie I love the many processes they offer in the second half of the book. I hope that gives you a good sense of what you can expect when you attend your first Abraham-Hicks event. Just trust yourself, your instincts and your own personal timing. You can’t go wrong with this stuff! Please drop me a line and let me know how your experience goes. I love hearing about your ahhas, insights and openings. Be sure to catch Esther and Jerry while you can – you’ll be glad you did! Thank you for this information it was really helpful yo me. I have recently become quite intrigued and fanatical over and with Abraham Hicks. I would love your input on becoming a life coach from this perspective. Hi Andrella. Thanks for your reply to Christina Merkley. 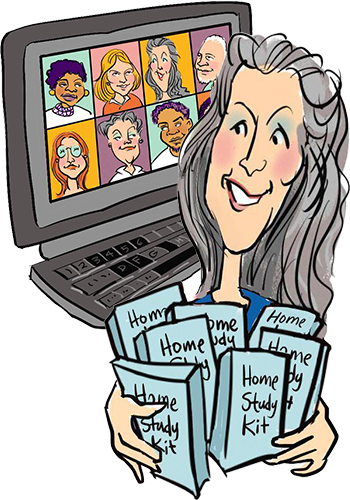 I’m Patricia Harris, on the SHIFT-IT Coach, Inc customer service team. Yes, the Abraham-Hicks material is amazing. Christina has studied them for over a decade, and, as per this article, highly recommends catching Esther and Abraham in person some time if you can! As for using Law of Attraction principles in your coaching practice … Christina recommends studying both Abraham-Hicks and THEO (we have co-programs with Sheila Gillette and The THEO Group). And just following your own intuitive guidance about what else you are personally attracted to. 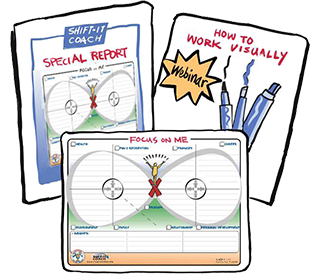 Christina’s signature system, The SHIFT-IT Visual Coaching System … has LOA principles embedded throughout it. For your own use on yourself, its available as a Home Study Kit, via SHIFT-IT Online, and through coaching with Christina or one of our Certified Visual Coaches. If you are interested in learning and being licensed to use it with your own clientele, you can apply for Visual Coach Certification. I hope that gives you the info you were looking for. All the best in your SHIFT! It was really nice to read through this blog… Have gone through several you tube videos of Abraham and wanted to go for her seminar…you’ve turned my wish into conviction… Thanks…?? You are welcome 🙂 Hope you enjoy your first workshop! I really recommend that folks interested in Law of Attraction catch Esther/Abraham live at least once. As a clairsentient type (feeler) the energy is REALLY palpable in person (it is with the recordings too but a higher/stronger level when in person). Good luck on getting into the hot seat if that is your desire! Love, love Abraham channeled through Esther. Had a reading by THEO Sheila Gillette it cost us more than $400.00 & truth be Told it was all a hoax!!!!! Nothing she said was true.. Nothing she predicted came to be. We were very receptive, aligned and open prior to and during the reading. We had read all of Abraham’s books, listened to their introductory CDs listened to many tapes before we scheduled with THEO via Sheila Gillette. There is nothing like Abraham! Nothing. Although we know that Esther was read by THEO via Sheila Gillette. It was the worse experience and waste of money ever. Every so often we listen again to Sheillas recoding hoping to find sonething she was right about.. Nope. Dead end. Sorry.. Sheilla Gillette may have been tuned in to THEO at one point but I seriously doubt she is tuned in at all these days. Hi, I’ve been reading and applying Seth’s philosophy for over 40 years. That’s Seth as channeled by Jane Roberts from 1963 to 1984 when Jane transcended. I’ve delved into Abraham, and to be honest, Abe sounds like a “Seth-lite,” with no disrespect intended whatsoever. I find it funny that all the latter day channeled speakers, and that would be Abe, Bashar and Elias–to name a few, all on Facebook and Youtube, have jumped on Seth’s, “You create your own reality.” And they all have re-packaged Seth to some degree or another in their own words. Of course Seth and the others are all spiritual colleagues and know one another in the timeless dimensions, and the messages vary widely due to the intelligence and vocabulary of the psychic medium doing the channeling. Of course, all the channeled entities are helping expand and uplift consciousness, and that is the idea. Thanks for your insights Dan. I used to co-run an online course and a longer mastermind program with The Gillettes. While I appreciated working along side THEO I’m no longer associated with them. However I continue to listen to Abraham to see where their message is going. Have always felt a real affinity to Jerry Hicks so with his passing its interesting to see how he continues to be connected (just from a different vantage point now!). Thanks Ron for your share. I’ve listened to most of the AH material. Jerry Hicks tells some great stories about his interest in Seth early on and his desire to know more about how to actually ‘create your own reality’. Not at a high spiritual or physics concept level but in the nitty gritty trenches of our day to day lives. Its said that his great desire to know this resulted in him and Esther coming together and her being able to be a clear channel for the next level of info to come through. I continue to appreciate Abraham-Hicks AND Seth for the varying levels that they address. And have also dabbled in Elias and Bashar. And more recently the work of Paul Selig. All hold a piece of the puzzle. And its interesting how each of us find the sources that we most resonate with, at least at a certain point of time in our lives. All the best with your journey! Hello Christina!!!! How wonderful to find you! Thank you for this very clear preparation for get ready to be ready to meet Abraham through amazing Esther and Jerry!!! What a gift! I feel and am ready by the grace of god!!! Its simply amazing how i became ready and receptive for this gift for life! A few months ago wile on the process of growth on my spiritual growth being sober after 30 years of addiction to drugs and alcohol . I received the gift of being alive and awakening to truth! I discovered myself and my purpose for this life and that i am a light worker and being at service is my beautiful purpose! Celebrating life as discovering wonderful teachers on my 2 years old magical Facebook!! !about 4 months ago my friend told me about Esther Abraham and the method that is used to bring us information. I talked about my teachers and then i went and looked to listen to Abraham…(.I’m having fun sharing this with you i didn’t share yet out loud… its a beautiful experience witnessing my own growth and readiness) and very fast i ran back to listen to my familiar beautiful spiritual teachers on my magical face book that spoke that same spiritual language that i knew and spoke… … saying to myself that every one has their own masters and different ways to understand….and then my wonderful friend from Greece sent me the movie the secret… and there i was again confused for they weren’t talking about my god and angels and all that save me and leaded me to where i got…. I wrote about my thoughts and did a inventory of my perceptions … how interesting it was so many emotions … and then i started to understand… and being connected to hay house radio one day i turned on my phone radio and Esther was speaking Abraham… i listen and uhauuuu she Abraham was talking about getting ready to be ready to be ready to be ready and i started to understand uahuuuu ….every thing clicked… when coming home i looked for Abraham on my magical you tube and started to listen and learn and learn understand and oh my dear Christine what a gift ! The gift for life!!! I am so grateful and appreciative to god my loving amazing angels and the beautiful spirits that were with me and all the way from the begining of my recovery all the earth angels that believed in me before i believed in myself!!! What a journey!! Now being ready i clearly understood the process for abraham showed up in my life with all the magnificent of all… lead me to the realization of being a child of my higher power witch i call god the creator i understand the amazing gift of our mind witch since the begining of my new life a grate teacher tanzin palmo brought to me the teachings of the taming of the mind… now understanding that i am the creator of my own reality and all these possibilities in life ….. Uahauuuu what a celebration… understanding resistance the contrast the receptive mode of being the momentum the power of the meditation manifestation and more and more and the most beautiful that there is so much ahead to learn and discover and that the guidance is here and the teachers are here to help us me to practice and live this life in joy when law of attraction can be the way of living life as a blessed one appreciating all the gifts that god gave us as humans … it feels and is like and for real the discovery of the treasure !!! Uahuuu amen! Now the maintenance nurturing this treasure by living it living this precious life that 2 years ago i was attempting to end! I am a miracle ! Thank you dear dear Christine thank you for you’re patience and for inviting us to share with you the wonders of law of attraction Abraham Esther Jerry! God bless Esther and Jerry for all they do for us humanity and the kingdom of animals!!amen! Thank you Christine for offering us your guidance for learning how to practice the gift for life the law of attraction!!! Now when someone will want what i have by the grace of god ill send them to you first for introduction and clear preparation to be introduced to Abraham Esther and Jerry! Dear Christina from far away and yet so close Suely from Israel. Please excuse my wrong speling o.k? With a smile in my heart and face thanking you again !!! Tchau!